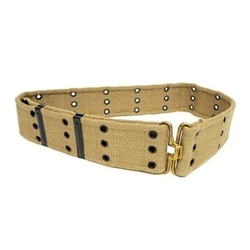 The Cotton Pistol Belt in Khaki is a regulation pistol belt. Made from heavy cotton canvas with black metal clamps and keepers. Includes a brass metal buckle. Just like our M36 pistol belt, these are adjustable to fit up to 38 inch waist.